Geese have been spotted by airline pilots flying at 30,000 feet. We wonder if meteorite showers are actually frozen goose droppings? About 46 people are executed in China every week. In Russian, about 2,000 soldiers are killed or severely wounded each year in the army's initiation hazing. So, when are we invading China and Russian to put an end to these practices? In 1992, the median age of a Harley-Davidson buyer was 38 and the median income was $53,700. Last year, it was 46 and $78,300. Pretty soon, only those with AARP cards and benefitting from Republican tax cuts will be riding Harleys. Book SIX is in the stores September 15th! 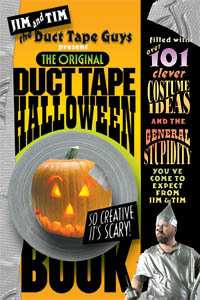 The "Original Duct Tape Halloween Book" is being shipped to your favorite bookstore as we type this issue of the newsletter. This is our best and wackiest duct tape book yet! It is a big 6 by 9 inches and full color throughout. Filled with over 101 creative costume ideas that are great for ANY time of year - Halloween or anytime a party or gathering requires a costume. The book also has twenty 30-second costume ideas that are quick and easy to make - all of the costumes are sure to get you noticed, and make people marvel at YOUR creativity! Take a peek at the book online, then rush off to your local store to pick up your copy (or buy it at the Duct Tape Pro Shop (Always autographed copies at The Pro Shop!). The book also has pranks, party and decorating hints. Duct Tape: It's Halloween Costume on a Roll! Jim and Tims on the Road again. In conjunction with the release of our Halloween Book, we will be doing a national promotional tour. Look for us in these cities" Baltimore, Chicago, Minneapolis, Denver, Seattle, and New York City. We are also doing a push to get on Conan, Craig Kilborn, the big network morning shows, etc.. So, watch your television listings. The Duck® brand is announcing three new colors of duct tape at the Columbus Zoo on September 20th, 2003. Jim and Tim will be there for this gala event which will feature lifesized animals made completely out of duct tape. Click the link above to vote on your favorite of the three new colors: Steel Blue, Gold, or Maroon. 2. 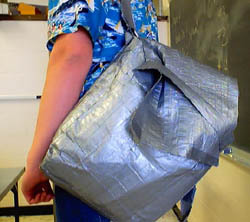 Duct tape fashion: Save HUGE bucks... instead of purchasing expensive brand name clothing, cover your last year's outfits entirely in duct tape. Go with silver for the heavy metal look, black for a mysterious/artsy look, or try one of Duck® brand duct tapes NEW Xtreme Tape® - it's duct tape in dayglo colors: hot pink, lime green, citron yellow, and blaze orange. The same colors that are so trendy with the Xtreme Sports participants. Duct Tape Sightings While at the graduation party for Jim's oldest (Emiah), I grabbed some shots of Jim's uses of duct tape. They're featured on this special page in our Duct Tape Sightings pages.Any time you have a duct tape sighting, snap a photo and send it to us. We award random submissions with desireable prizes (like autographed books, shirts, etc.). 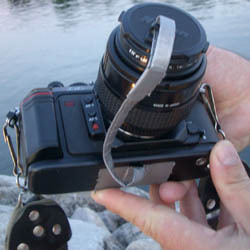 Lenscap Retainer If your camera keeps losing it's lens cap, make a little duct tape retainer strap. 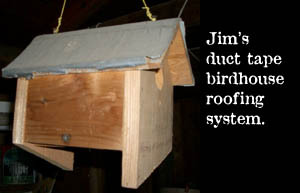 Works great and costs nothing but a little time. - Jana N.
Tire Repair Four friends and I went on a hunting trip. Before daylight, I ran over someone's hunting stand in the road and blew out my tire. We put on the spare and went hunting. That evening, we moved to a new spot and heard some air leaking. There was a stick in spare tire we had just put on. We were fifty miles from town and no new tires. We looked in our tool boxes to see what we could fix the leak with. I found a roll of duct tape. My friends laughed and said, "You can't fix a tire with duct tape!" Then I started thinking... I rolled up a little plug out of a strip of duct tape about ten inches long (sticky-side out). I jammed the plug into the hole with a screwdriver and melted the tape with a lighter and used the screwdriver to spread the molten tape around the outside of the hole. Using a 12 volt air compressor, we aired up the tire and it held all night and fifty miles back to town. The guys at the repair shop were totally impressed with our duct tape repair job! --- Jacob C.
14. Why do "overlook" & "oversee" mean opposite things? dead tree and eat candy out of your socks? Send your student back to school in style - a duct tape t-shirt not only looks great, but helps you evangelize the "Gospel of Duct Tape." 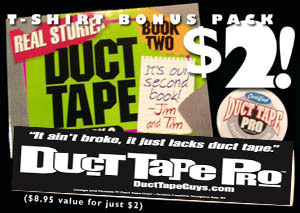 This fall, you can buy any t-shirt at the Duct Tape Pro Shop and nab a bumper sticker, Duct Tape Pro button and an autographed Duct Tape Book Two, Real Stories for (over $8 retail value!) for only $2! Heavy Metal Guitar Redeaux If your guitar is looking bad because of road wear, or if you've grown tired of the color, grab a roll of duct tape like Andrew from Georgia did. Cover your ax with a new surface that's not only resilient to scratches and dings, but also makes a statement. Like coming up with captions for photos? Visit our Photo Caption Contest - a new photo every month (with the new newsletter). You can win fabulous prizes and have fun at the same time! Click here. Still time to enjoy the dog days of summer! 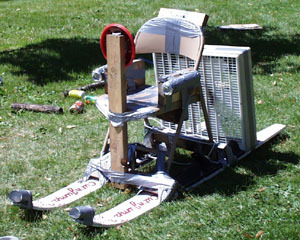 Make yourself one of these stylish swamp cruisers with some water skis, a folding chair, an electric fan (with a really long extension cord) and duct tape. Warning (for those idiots who might actually try this): Water and electricity don't mix. You WILL get electrocuted! RANDOM WINNER: The random winner of a duct tape book in this issue: Fred Krabach. Congratulations! Send us your mailing address and we will send you an autographed Duct Tape Book.